Doop de doop de doo. 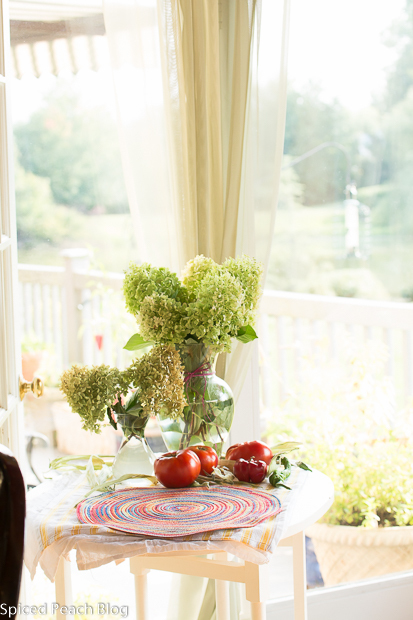 It was the sort of made up chime she would sing out loud to herself while busily cooking in the small kitchen, who’s broad window spanned the width of the maple table, facing the large dogwood tree in the front yard. Uncle Mike had planted it. I spent many a meal at that table as a child, where on frequent occasion, in the middle of cooking, upon a tune like doop de doop de doo, Aunt Betty would swoop me off the chair, grabbing both hands, and we would circle round and round to the made up jingle until the dance ended in a resounding laugh and a big kiss on both cheeks, that is, after they got a bit of a pinch. By mid-morning music filled the room from the side counter by the door through the large wood covered radio box whose beige colored front clearly displayed the basics of operation, on-off, stations, and volume. There were many songs over those years whose rhythm and tunes hold memories, precious, even today, reminding me of certain ages and stages of life upon hearing them. Having an abundance of friends, the wall phone, its approximate 6 foot long cord located just to the left above the counter hosting the radio, alongside assorted homemade cakes and pies for unexpected guests dropping by, rang incessantly. Aunt Betty’s sing-song voice ever enthusiastically greeting the caller. Whenever I was there, she would, about five minutes into the conversation, inform the caller that “Peggy Ann was here” indicating that the call needed to be short. From there she would rapid fire talk, and talk, and talk, for around ten minutes, announce she had to go, hang up, and declare, Woo! That such and such person could really talk! Even as a child I thought this entirely confusing as it appeared the caller on the other end of the receiver never got a word in edgewise. Observing the years of chatter filled conversations left me with a couple of impressions, one of which, they were never surrounded by gossip, or any ill will toward others. For what appeared as endless mundane talk really surrounded the simple celebrations of life, day by day, and season by season, a term frequently referred to by Aunt Betty as “Good Eats.” The term meant many things; what was on sale at the supermarket, which restaurant would serve the best crabs over the weekend, what were the season features of the day at the Farmer’s Market, should they pick their own fruit and produce at area farms and orchards now or later, who was up for the adventure, where to get fresh crates of goods that could be split between friends, what produce was still too dear (meaning too expensive), what would be served at a get-together she was hosting, what she would prepare to contribute to a friend’s party, how she would prepare some garden produce gifted from a neighbors garden down the street, and it went on and on and on. With an abundant crop of tomatoes in my garden this summer, Aunt Betty agreed to help me out in their roasting and canning into jars for the winter ahead. Lest anyone think I’m repaying a debt of memories to this eighty-eight year old woman of whom I owe so much, truth is, she continues to make an impression on my life. 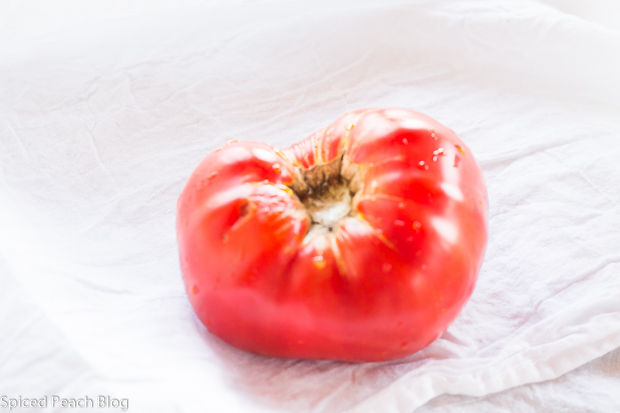 Perhaps there are countless women at this age that can still core a tomato as fast as any young restaurant kitchen help, or skin a just roasted blistering hot tomato right out of the oven, but I don’t know them, I only know Aunt Betty. So, as we chatted while busily at work on the tomato canning effort, I got around to the case of the gold metal box. The gold metal box presented to me by Aunt Betty about a year back, filled with recipes. Placing it in my hands near took my breath away with excitement, a lifetime treasure box. Well, all until I opened it to find an accumulation of assorted filed cards and bits of paper filled on what likely tasted good at another friends home gathering, perhaps with intention to prepare it on another occasion. Aunt Betty obviously admired short cuts and delicious baked goods mixed with a bunch of pre-packaged stuff, but always sticking to the homemade, she was likely too busy talking to ever get around to figuring them out. As a young child I would likely have been over the moon with joy about jello with marshmallows and cool whip, but the reality is, outside of being able to pick any kind of soda I wanted from the basement refrigerator, nothing of the like ever appeared in Aunt Betty’s Kitchen. There were some old newspaper recipe clippings, and some odds and end notes. Easily sorting the recipes of homemade baked goods, and a couple surprise recipes of my Grams, I was baffled. Where is the real stuff? I mean the creamy rice pudding sprinkled with cinnamon? The pickled vegetables served on holiday trays? The soups? The stews? Where were the recipes of the woman who prepared no less than sixteen vegetables at the Thanksgiving feast? Where was Aunt Betty’s Tomato Gravy recipe? None of it put to paper. Summers came and summers went. There was sweet corn, beans, and peaches, and bushels of tomatoes. Aunt Betty’s phone rang incessantly, never was there gossip or ill will, there was fresh tomato gravy for dinner. Enjoying a bit of an outside rest in the sun following the canning of this summer’s garden tomatoes, Aunt Betty who still prepares Tomato Gravy carefully discussed the amounts and details in the process. 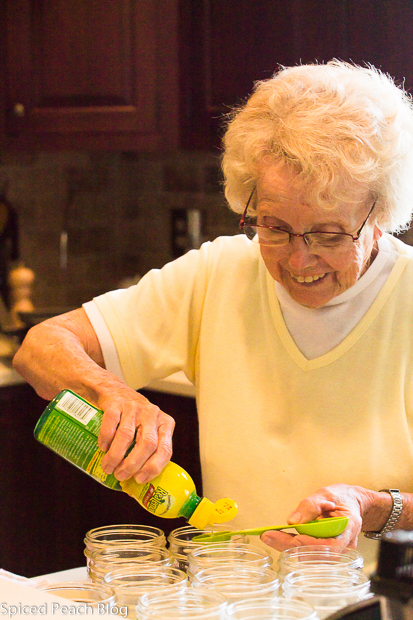 A young mind and heart of many years, Aunt Betty also finds delight in the new recipes of the day, ways of preparing foods just a bit lighter. Using giant ripe red juicy ugly tomatoes which she and Uncle Mike always insisted were the best, I set to preparing Aunt Betty’s Tomato Gravy, Updated. 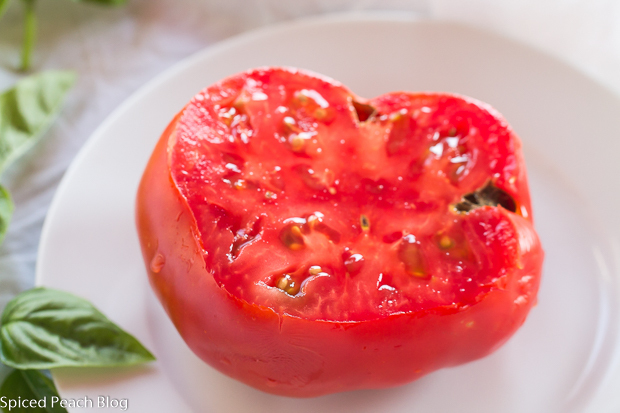 Grabbing a fork, and knife to cut through the toasted slices of crusty loaf, just the type I used to savor at the maple table overlooking the dogwood tree, topped with the simmered hot, creamy, fresh smashed tomatoes, I first paused to say a prayer of thanks. Bless us O’ Lord for all of your bountiful gifts, Doop de doop de doo. Preheat oven to 350 degrees. Lay the slices of crusty baguette onto an oven rack and cook until toasted and crunchy. 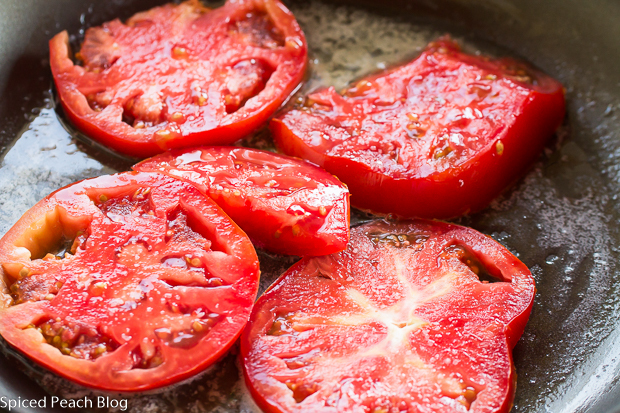 Melt butter in a large nonstick pan, lay tomato slices evenly all around the pan, sprinkle with salt and pepper, cook on low heat about a minute and a half, turn tomatoes over, cook another minute. Sprinkle half of the flour or a bit less, enough to lightly cover tops of tomatoes, increase heat to medium and flip them over, flour side down, so tomatoes begin crusting from the flour, around two minutes. Sprinkle the rest of the flour over the top of the tomatoes, flip over, cooking until the flour on the other side begins browning. Increase temperature to full medium high heat, pour in a quarter cup of the milk and begin smashing the tomatoes using the back of a wooden spoon, incorporating the hot milk, pouring in a bit more if needed for further creaminess. Cook mixture until very hot and just bubbling, sprinkle in basil strips, stir, check seasoning. 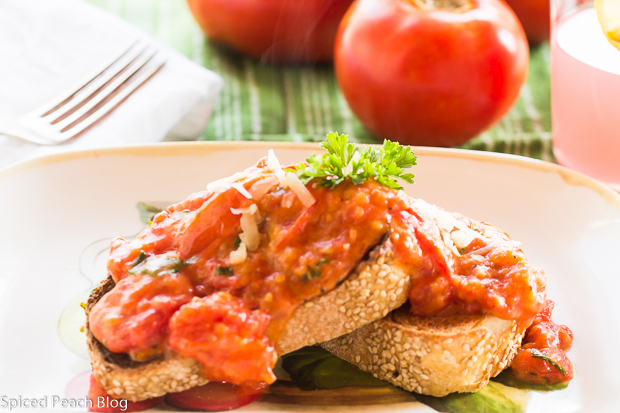 Pour hot tomato gravy over toasted crusty bread slices. Sprinkle with fresh grated Parmesan cheese and serve immediately. Add milk to a small pan along with the peppercorns, bay leaf, and onion end, simmer on lowest temperature for around three minutes, turn off heat and let infuse ten minutes. Reheat milk to hot just before pouring over the flour crusted tomatoes. 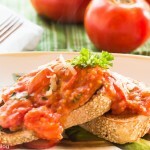 This entry was posted in Veggies and tagged Aunt Bettys Tomato Gravy, Old Fashioned Tomato Gravy Updated, Summer Tomato Gravy on Crusty Bread, Tomato Gravy, Tomato Gravy Recipe. Bookmark the permalink. Post a comment or leave a trackback: Trackback URL. Oh well this sounds declicious and as usual you have such a way with words in your storytelling! I have never heard of infused milk but now I am very interested in trying it out! Thanks for sharing this story with us! Rachel B recently posted…Our First Week in Switzerland! Thanks so much Rachel! The infused milk really gives an added dimension of flavor, simply done! This dish is so delicious! So excited about your Switzerland move and look forward to seeing more of your adventures along the way! Thanks for stopping by. How lovely to read your story, Peggy. Your photography is beautiful, too. I enjoy your share as usual. Hello Jolma, so good to see you and thank you so much. This is a special dish to me and I really enjoyed the adapted flavor making it a bit lighter, I’m lucky to have Aunt Betty. 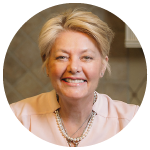 Thanks so much again and hope to see you soon on Beyond Her Kitchen! 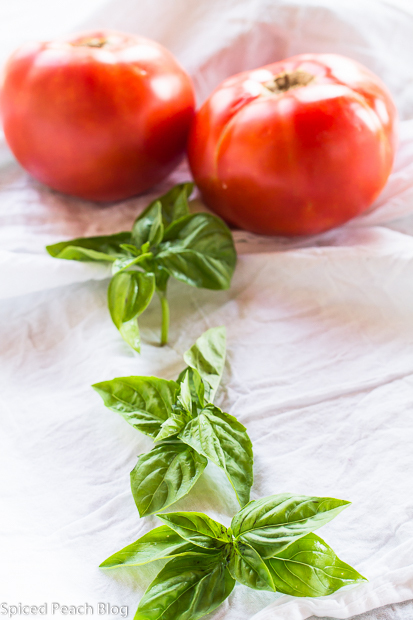 How simple is this recipe, Peggy…and so wholesome..tomatoes, milk, salt and pepper, basil…fast and fresh and total comfort food..
Hello Pragati! Thanks so much. I know, I love my Aunt Betty too, she is amazing! This recipe is so simple, quick, easy and most of all delicious while bringing so many good memories. Congratulations on the announcement of your first e-book: 30 days of Daal! Very exciting and best wishes for much success!